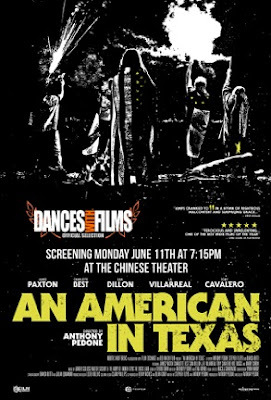 Producer turned director, Anthony Pedone premieres 1990, Bush era Punk film, “An American in Texas” at the Dances With Films Festival. The green-carpet much anticipated premiere is scheduled for June 11 at 7:15 p.m. at the Chinese Theater in Hollywood. Written by Pedone and childhood friend Stephen Floyd, the film tracks the unbreakable brotherhood of an angry, crackling and defiantly disordered underclass of nowheresville punk-rock kids played by James Paxton (Eyewitness), Charlotte Best (A Name Without A Place), Sam Dillon (The Ballad of Buster Scruggs, Memoria), J.R. Villarreal (Spare Parts) and star of Nickelodeon’s School of Rock Tony Cavalero. The boys see their band as their ticket out of small town Texas as Operation Desert Storm ramps up. Faced with the reality of a dead end job at the plastic plant, a life in the oil field, or fighting a war that has no meaning to them, the group's chaos and imminent adulthood leaves them completely vulnerable for what ensues. Rounding out the cast of is a Texas sized list of supporting cast including, Texas Hall of Fame Actor, Barry Corbin (No Country For Old Men), Holt Boggs (Queen of the South) David Sullivan (Flaked), David Yow (I Don’t Feel at Home in this World Anymore), Zander Schloss (Repo Man) Keith Jardine (Inherent Vice), Quinton Aaron (The Blind Side), Christopher Matthew Cook (Dog Eat Dog) and legendary Dead Kennedys frontman, Jello Biafra as the mayor of small town, Victoria. Music for the boys band is performed by the rhythm section of seminal punk band, The Circle Jerks, and written by bassist, Zander Schloss who also handles the vocals on songs originally written for a new Circle Jerks record. Although Anthony has produced over 15 features, shorts and documentaries, "An American in Texas" is his first time in the director chair. Pedone produced "The Strongest Man" which world premiered in 2015 at the Sundance Film Festival and is the Founder and Program Director of The Victoria Texas Independent Film Festival and Executive Director of Film Exchange. He is currently working on a new documentary with Blowback Productions, and HBO about stress; and just wrapped on Kenny Riches’ new feature "A Name Without a Place" starring Patrick Fugit, Elizabeth McGovern and Chris Parnell.